With Aedes de Venustas Musc Encensé, it’s all about texture. A musk-centered fragrance — especially one that puts incense on the billing — could easily be stifling and itchy, a fur stole of a perfume. Musc Encensé, however, is a vapor that hangs as sheer as the waft off of a cup of tea. It’s the sort of fragrance you spray on, forget about, then later catch a whiff of something nice and realize it’s you. Ralf Schwieger composed Musc Encensé. Its notes include clary sage, cashmeran, tonka, musk, incense and leather. The musk-savvy perfume lover will want to know what kind of musk this fragrance embraces. Is it the skank of Serge Lutens Muscs Kublaï Khan? Or maybe the white musk of another Serge Lutens, Clair de Musc? Could it be a laundry musk, like the Clean empire was built upon? I first sampled Musc Encensé with Kevin, who couldn’t smell anything but a hint of alcohol. So, for some people, Musc Encensé might be a non-musk musk. Me, I smelled a comfortable, warm musk like Coty Vanilla Musk, but much less sticky and thick. A Tonkin musk. Think a whisper-weight silk button-down versus Coty's acrylic turtleneck. Dabbed on, it’s even a bit peppery. Sprayed, not so much. How about incense? Any incense in Musc Encensé is subtle and not sharp or dank. In fact, puzzled at the lack of an assertive incense note, I ran to my dictionary and learned that “encens” translates as “incense” in French, sure, but “encensé” can also mean “highly praised.” Clever. Musc Encensé is a comfortable, fairly linear musk with a feather-weight floral leather heart and a tonka-tinged dry down. A hint of green and a jasmine tingle keep the musk from feeling heavy-footed. Dry wood and suede save it from soppiness. Its cashmeran gives it the familiar comfort of a family room sectional sofa strewn with soft throws, with the television stuck on the Hallmark channel. Amber and tonka sweeten Musc Encensé after its first half hour. All in all, Musc Encensé is the ideal fragrance for someone who wants a warm, delicious, non-intrusive background scent to toss on. It doesn’t make a statement. It doesn’t demand attention — or detract from it. True, Musc Encensé might not break new ground. But the ground it treads can definitely use a few more elegant passersby, especially one as artfully crafted as this olfactory wingman. 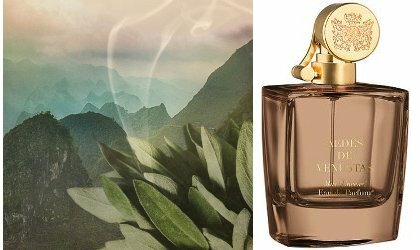 Aedes de Venustas Musc Encensé Eau de Parfum is $245 for 100 ml. For information on where to buy it, see Aedes de Venustas under Perfume Houses. Thanks for the review, Angela. This made me think of Cacharel Noa – a soft, green, go-to floral musk with a hint of incense. You’ve smelled it, then? I haven’t smelled that one in so long that I can’t be helpful and chime in. That’d be Noa 101. Noa is a very comforting – if further nondescript – fragrance. Nice nonetheless. Methinks I can live without this. Totally agree with you Angela! Musc Encense is a really well made perfume, more quiet in style but smells amazing. Sometimes a quiet musk is a welcome musk! Sounds like a great office scent! I need to stop by Barneys or perhaps Aedes downtown! Your review is very cuddly. I will add this one to my must-sniff list. Cultivating an appreciation for musk is one of my current perfume-life goals. I’ve smelled too many that make me feel like I have fur stuck up my nose. A quiet musk sounds delightful. Could this be the musk version of Infusion d’Iris’, that iris with the volume turned down to 3? Or it might be a zero musk, a non-musk musk for me? My nose has encountered a few of those. Musk is so tricky! It has so many different personalities–and quirks with smell-ability. The Aedes bottle is great, but my favorite bottle for fondling is the Sylvaine Delacourte Florentina bottle. It’s so heavy and egg-like! Incense is a new note for me that I’m exploring more. Curious to see how Aedes handles it. This one isn’t very incense-intense to me, especially compared to the very first Aedes–the one before the rhubarb one. I’d be interested to know your take, though!